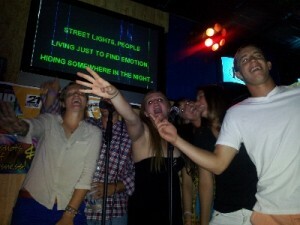 Karaoke Can Make Parties Great Fun!! We provide you with the option of adding Karaoke to any Gann’s Knoxville DJ Mobile Show entertainment package. We also can entertain your event with just Karaoke, or we can add karaoke into the party mix. Karaoke can be used as an alternative form of entertainment between dance segments. We provide a full library of popular song tracks to choose from. We also provide song books for your guests, helping them find their favorite songs. We bring the video monitor which displays the song lyrics, two microphones, and a professional sound system for any venue. Karaoke is a great way to entertain at company parties, reunions, school functions, or anywhere you want to have crowd participation. Chartbuster is the world leader in karaoke, offering the hottest new songs in country and pop from the Billboard charts. Many times they offer songs before they even hit the radio…they’re that fast! If you love to sing, Chartbuster’s got the songs! We also give you the opportunity to rent a portable Karaoke system. They come with everything you need. All you will need to provide is the TV monitor. The rental system comes with a wide range of music. Please come by Gann’s Knoxville DJ Mobile Entertainment and take a look at this karaoke system for yourself. The store is located at 2305 West Emory Rd, in Powell, TN. Call us and let Karaoke make YOU the star!